Rowing machines are some of the most challenging workout equipment available on the market. For full body cardio exercise, it is up there with the best and should definitely be considered by anyone wanting to lose fat, gain fitness and improve health. ✅ This Specific Compact Rowing Machine is the most popular. Its a fantastic rowing machine with the vast majority of reviewers giving the maximum 5 star reviews. It separates and folds up easily for storage and is perfect for home use. Its no wonder we chose it as our No.1 recommended compact rowing machine ( To read more about why it is so popular, read our full review below). Unfortunately, rowing machines used to be quite large in size and not the most suitable exercise machine for home use. However, thankfully things have changed and now there are many sleek and compact designed rowing machines that can easily be used in a small room. Not only are they more compact, but there are many folding rowing machines available that can be folded up to half their size. These foldable rowers are excellent for storing away when not in use. In this article, The Best Compact Rowing Machines For Home Use 2019, we will be reviewing some of our favorite compact, folding and portable rowing machines, that will be an ideal choice of exercise equipment for small spaces. When an exercise machine has over 1500 reviews on Amazon, with 93% of them being 5 stars, you know you have a high quality product. 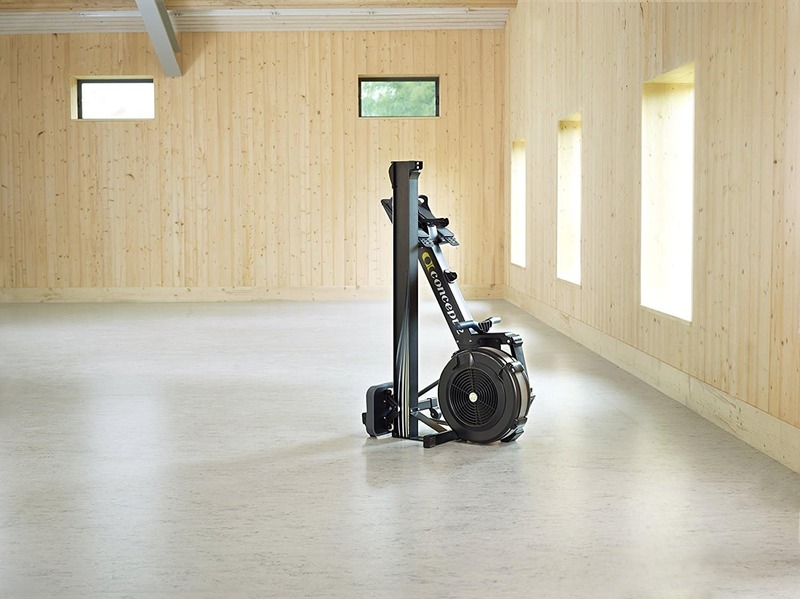 This bestseller is the complete package when it comes to rowing machines and is suitable for small spaces. If you are looking for a professional gym style rowing machine, suitable for home use, then read on. Apparently, the Model D (the Model D is the most popular one) has a lot less assembly than the Model E. It has almost everything assembled already, except for connecting the main parts. There is a screwdriver provided for the few screws and the instructions are clear and easy to follow. It shouldn’t take much more than 10 minutes to assemble. Item weight – 57 lbs. The Concept2 will not be the smallest rowing machine reviewed in this article. It measures 9 feet in length, which may appear quite long, however it is quite narrow at 2 feet in width. Overall, you will need a space of 9 feet by 4 feet, so that you have room for your arms to comfortably go through the rowing motion. The beauty of this rowing machine is that when you are finished your workout you can fold the rower up for easy storage. Folding it up is very easy and takes no effort. When it is folded up, it will only need 2 feet by 3 feet of floor space. If you are new to rowing then you may need a little while to get used to the rowing motion needed to perform this exercise correctly. However, after a few minutes you will get the hang of it and then really feel the benefits of this great machine. The seat is purposely hard and you will feel it in the beginning. This is because your glutes are weak and not conditioned. The seat is hard so that it will improve circulation through the legs and glutes. After a few weeks of rowing, your glute muscles will have developed and strengthened and the seat will not feel hard anymore. The rowing machine is not very noisy and uses airflow as resistance. By adjusting the airflow entering the flywheel, the difficulty of the stroke can be increased or decreased. The rowing motion is smooth and comfortable. The footrests can be adjusted for all shoe sizes and we really like the ergonomic handle that allows you to row with a natural hand angle. The Concept2 may not be the smallest rowing machine on the market, however it surely is one of the best. It is a hugely popular rower and although not cheap, it is a lot cheaper than its competitors that provide a similar rowing machine. It is an excellent rower to provide a smooth workout and if used consistently, will definitely improve health and fitness, condition the whole body and burn fat. The folding feature is a big sell for us because it has such a small footprint for storage. If you are looking for a proven high quality rowing machine that is perfect for easy storage in small spaces, then look no further than the Concept2 (Check out the excellent demonstration of the Concept2 in the video below). This magnetic rowing machine by Sunny Health & Fitness is a solid piece of equipment and more budget friendly. It provides a smooth, quiet, no impact workout and is quite compact in size. This rower also has built in wheels, making it easy to move around and can be folded up to half its size for easy storage. Assembly is very easy and the directions were very straight forward. There are 5 steps involved in assembly and each step is bagged separately. Any tools required are also provided. The step by step guidance of the bags and directions make assembling a breeze and shouldn’t take much more than 15 minutes. The overall assembled dimensions of this rowing machine are 82″ L x 19″ W x 23″ H, which is almost 7 feet in length. For a rowing machine this size isn’t bad, however it can be folded up to half its size, which is great for storage. The fold up dimensions are 35” L x 19” W x 50” H. As you can see, most of the storage space needed will be vertical. It is very easy to fold up and because it has transport wheels, storing will be very easy after each workout. Overall, this is a good space saver. The rowing machine has 8 levels of resistance and as you progress you can increase the resistance level. Throughout all the levels, the gliding motion is smooth, even and quiet. The seat is quite comfortable and has a lip shape at the back to prevent you from sliding off the back during vigorous workouts. The display unit is rather basic and shows strokes, calories and time. Although this is a decent quality rowing machine, you do get what you pay for. 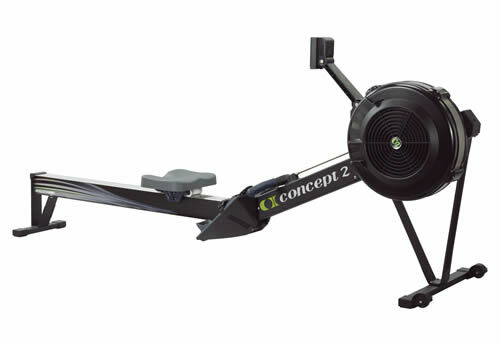 It is a lot cheaper than the Concept2 (reviewed above), however it is of lower quality. The Concept2 will probably last for many more years than this one. That being said, this rower will perform well and will provide a good workout. It is smooth, quiet and its fold up feature makes it a great choice for small homes. We rate this rowing machine as a solid, affordable rowing machine, that will give a good workout and won’t take up too much space. This compact rower by Stamina is the smallest machine so far, and as it can be folded up for better storage, it is a good choice for small spaces. It is a decent rowing machine that is pretty popular due to its affordable price and high ratings. It may not have the frills of a more expensive option but if you are looking for a solid rowing machine to get in shape and not looking for a professional style machine, then it is a good option. Instructions are clear, detailed and easy to follow. Fasteners come in separate bags and are labeled, making it easy to find and use on their appropriate parts. Assembly should take around 30 – 45 minutes. The rowing machine weighs 54 lbs and has an assembled measurement of 77” L x 18” W x 22” H. These dimensions are excellent for small spaces and ideal for small home gym rooms and small apartments. It also has a folding feature and can be folded up to only 48” L x 18” W x 28” H. This is a really small size for easy storage and therefore if you don’t mind clearing the workout area after your gym session, you can store it away in a small area. It uses an air transfer system which adapts to your performance. If you row faster, then it will adapt to you and if you slow down, then it will respond again. This works well because it means you don’t have to change resistance levels manually if you want to row harder or easier. The seat is padded and quite comfortable. It is smooth to row on and the resistance level is constant. One area that might be an issue is the noise level of the machine. It is the fan that generates the resistance and it is the fan that makes the noise. Therefore, the harder you row, the louder the noise. Our advice is that if you plan on working out really vigorously, then you may need to turn the TV up or wear headphones. If you plan on exercising at an average rate, then noise shouldn’t be an issue. Overall, a solid piece of equipment for performance and structure. It has a good price and is an excellent choice for the average user wanting to improve health, fitness and lose some weight. It is a very compact size and the fold up feature makes it easy to store and ideal for small spaces. Although, the most expensive rowing machine we are reviewing, this rower is a serious piece of equipment. 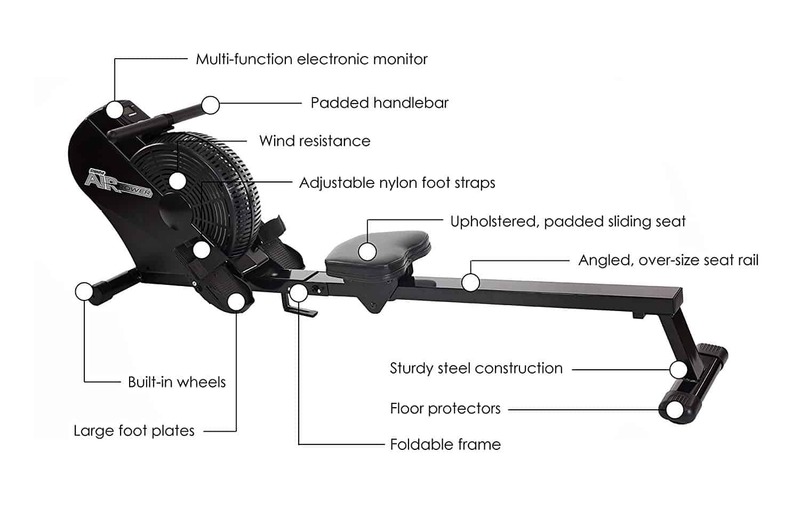 This compact rowing machine by Water Rower is handcrafted and uses a ‘water flywheel’ that replicates a real rowing feeling. The flywheel is in a water tank and provides a smooth, even and quiet resistance. The main portion of the rowing machine is pre-assembled and the rest should take around 30-40 minutes to finish. Instructions are clear and tools needed for assembly are provided. The overall measurements of the water rower are 84” L x 21” W x 22” H . It doesn’t fold up for storage however it is portable with wheels attached. What makes it an excellent space saver is that it can be stored upright. When stored upright, it really only needs minimal space. The rowing stroke on this machine is incredibly smooth and fluid. The water tank allows the rowing machine to mimic a real rowing motion in water. Just like when rowing in water, the faster you row, the more resistance, the slower you row, the less resistance. This self-regulating rowing style occurs on this machine. Unlike magnetic resistance systems where you set a resistance level before you start rowing, this water system changes resistance by how fast or slow you row. Not only does the water rowing system make a very smooth, non-jerking rowing motion but it is also very quiet to use. The ash wood construction also helps with sound reduction because the wood has the ability to absorb sound and vibrations. This is a rowing machine that is made for commercial gyms and for heavy duty use, therefore is definitely built to last. Its solid construction has a weight capacity of 1000 lbs. This heavy duty rowing machine by Water Rower is an outstanding piece of exercise equipment. Not only is it built for commercial use, but it is also smooth and silent. We love the water replicating rowing style and the real rowing feel it provides. It is an expensive rowing machine, however you certainly get what you pay for and this machine will last for years to come. If you are looking for a heavy duty, high quality, quiet and smooth rowing machine that has a small storage footprint, then this compact water rower is a great choice. This affordable compact rowing machine by Stamina, will give a solid workout for a bargain price. Using a hydraulic system and 12 resistance levels, the rower will definitely challenge all levels of fitness. It is compact in size and has a small footprint, making it an ideal choice for small spaces. Assembly is a piece of cake and shouldn’t take much more than 30 minutes. The instructions are in picture form, making them very easy to follow. The tools required for assembly are also provided. 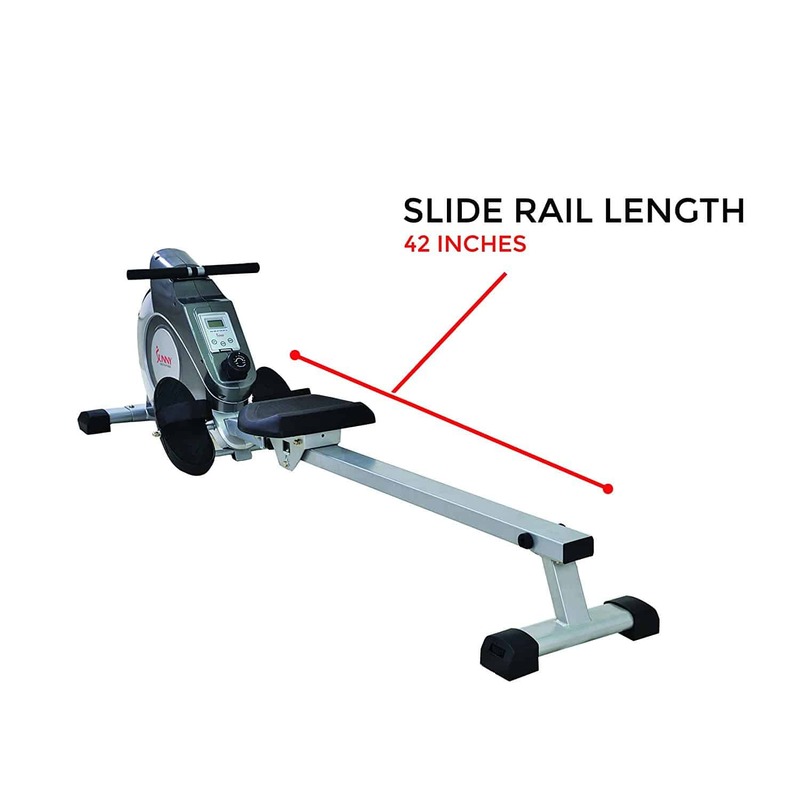 This compact little rowing machine has a footprint of only 46” L x 23.5” W. You will need some extra width when performing the rowing action, therefore it is recommended a space of 58” L x 43” W is needed for comfortable rowing movement. The rower can also be made smaller for storage by tucking the arms in, making it more narrow. It should fit into an average closet space when folded up. It is a quiet and smooth machine that replicates the real rowing action quite well. There are 12 resistance levels to choose from, however we are not sure how well the machine will be able to withstand the strength of a person at the high levels of resistance. A number of customers have had an issue keeping their feet in place with the footstraps, however this is a minor issue. We like the compact size and how quiet it is to use. For the average user, this rowing machine will definitely get your heart rate up and provide a solid workout. Overall, this machine is a popular choice on Amazon for rowing machines and for the average user looking to gain some fitness and lose some pounds, then it is a solid, affordable choice. However, for the more seasoned gym goer, it may be a little basic and may not be able to hold up to vigorous use. 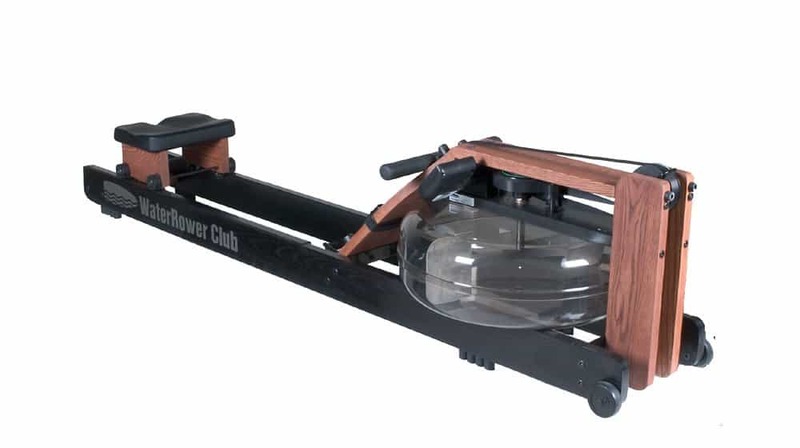 As a space saver, this compact rower is an excellent option. If you are on a budget, why not consider a mini trampoline as an inexpensive way to get fit and healthy. When buying a piece of exercise equipment, there are a few things to consider before you make the purchase. Firstly, make sure you have enough space to not only store the exercise machine but also enough space to exercise comfortably. This is especially true with a rowing machine in a small room. Unlike a compact treadmill, where your arms and legs won’t be outside the running deck, a rowing motion will have your moving arms wider than the rowing machine. Therefore, make sure you have some added space greater than the machine’s dimensions for comfortable movement. Another obvious consideration is the budget. Like with most purchases, you get what you pay for. A bargain rowing machine doesn’t mean a poor quality machine, however it will more than likely be of lesser quality to the more expensive option and will have basic features. The cheaper option will be more than good enough for the average user, for example a beginner or a person looking for light to medium exercise. If you are fitter than the average person and want to do some serious exercise, then you might want to consider investing in a higher quality option. The rowing machines in the reviews above have a good range of price options and all are highly rated. Rowing machines come in all different price ranges and can be quite an investment, therefore we know you will want to maintain it so that it will work well for a long time. Firstly, we expect you to build up a sweat with each and every workout, so it is important to wipe off the sweat when you are done. Not only is this good for odour control but more importantly it will keep your rowing machine looking as good as new, for longer. If sweat isn’t removed, it can eat into the paint and powder coat, which will then cause rust. A rusty rowing machine isn’t a good look. Secondly, keep the guide rail clean and free of dust and debris. This doesn’t have to be done daily but it is worth keeping an eye on. Maybe, a weekly maintenance wipe down will be a good routine to have because if dust and debris builds up in the guide rail, it will not only affect the quality of your workout movement but it could also damage the wheels and rail. Finally, if your rowing machine has a chain, then make sure that it is lubricated with oil every now and again. Every few months should be enough, but once again, just keep an eye on it. You don’t want to over oil it because it might build up with gunk, however a light oiling every now and again will keep it running smooth and rust free. Check the maintenance guide that is provided with the rowing machine. The quality of your workout rests on the quality of the moving parts, therefore it is essential to maintain your rowing machine, so that it will provide quality workouts for years to come. If you would like to read some reviews on compact elliptical machines or some compact exercise bikes suitable for small spaces, then click on the links. 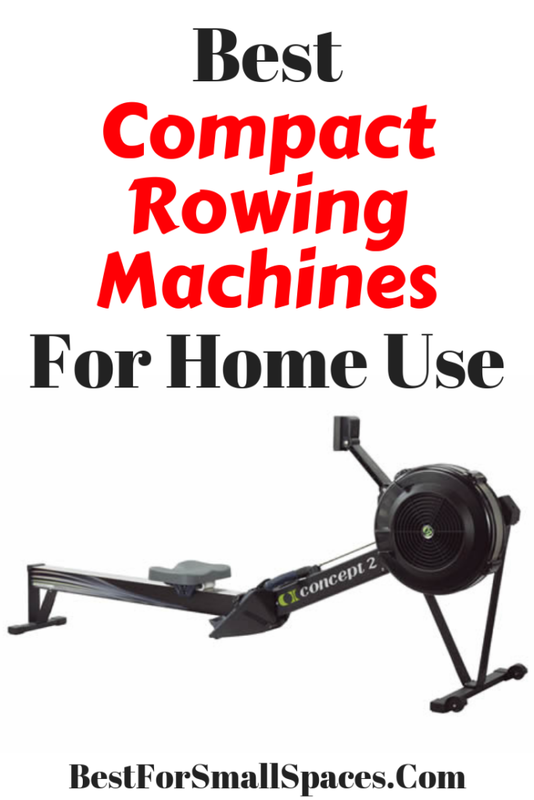 We hope you found the Best Compact Rowing Machines For Home Use 2019 reviews helpful and you were able to find a suitable piece of exercise equipment for your small space.